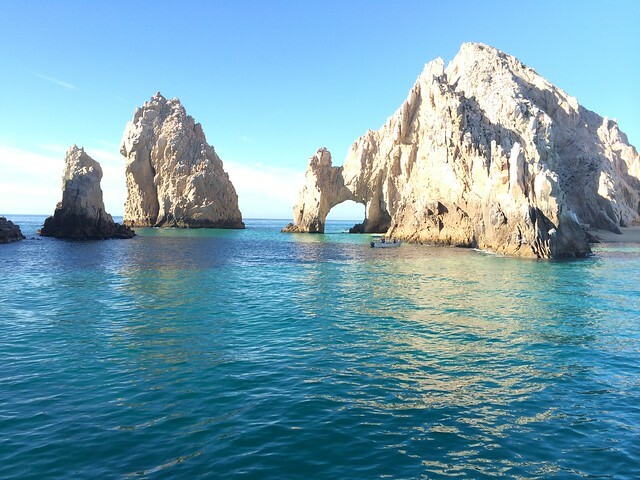 I have been lucky enough to tag along with my parents to Cabo over the last few years. That trip is really something to look forward to when you live in Chiberia. Especially this year! We take it easy on vacation and spend a lot of time enjoying the views, reading, swimming, fishing (dad only), walking on the beach, trying new restaurants, meeting new friends, kayaking, working out, etc. It is exactly what vacation should be! The first few times we went we barely left our resort for some reason. Then in the last couple of years we have been all about trying new restaurants. 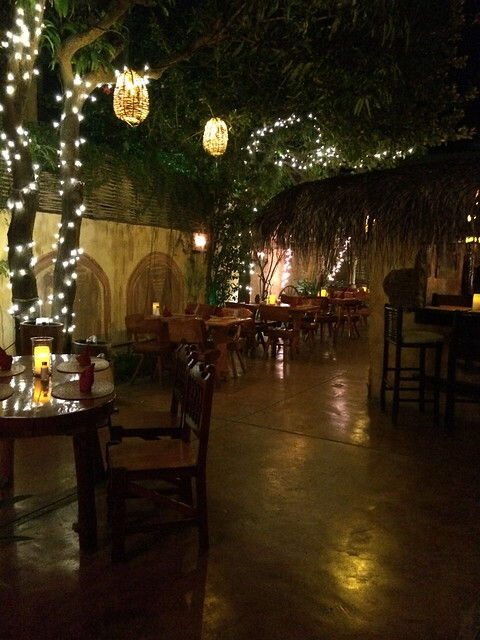 Cabo has some fabulous fine dining venues and charming holes in the wall with great food. 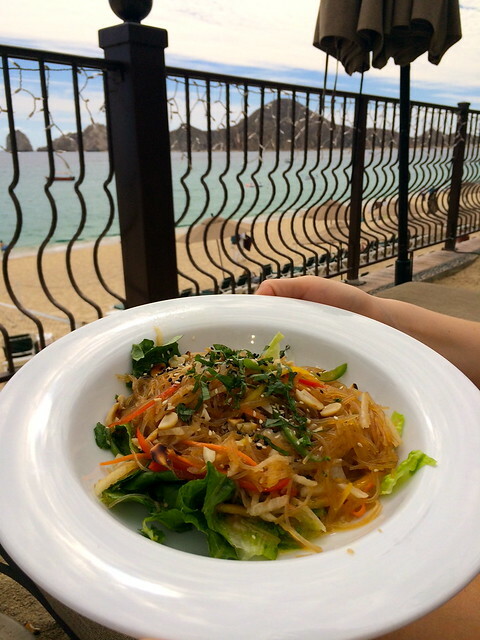 If you have an upcoming trip to Cabo and want some restaurant recommendations, shoot me an email at PerfectingThePairingBlog@gmail.com. We keep notes on our favorites. We love to sit outside and have the chef prepare the fish my dad caught that day. This is just one of the charming spots that we go to every year. Mom and I fell in love with the hanging basket lights that are all over Cabo, and actually brought some back with us this year. We usually stick around the resort for lunch. They had a new item on the menu this year called a Spring Roll Salad. Basically it is a deconstructed spring roll in salad form served over lettuce. It was the perfect poolside lunch. Let’s be honest, anything with this view tastes pretty great. I was determined to recreate the salad once I came home, and I think I came pretty close! 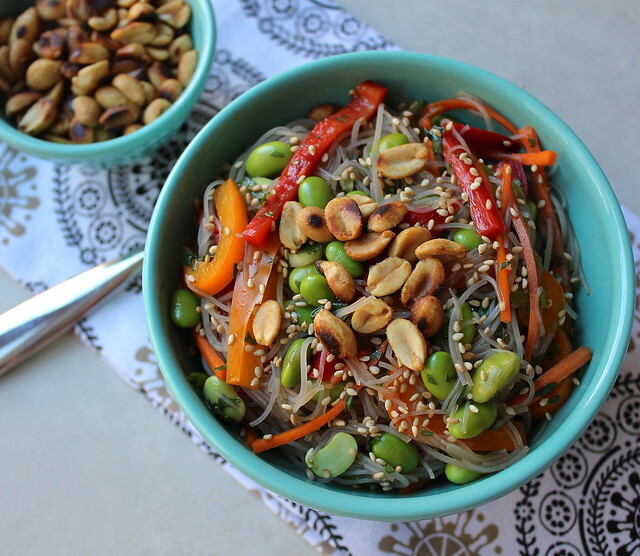 Thin rice noodles are combined with carrots, peppers, edamame, and fresh herbs (great time to use the herbs you are growing! 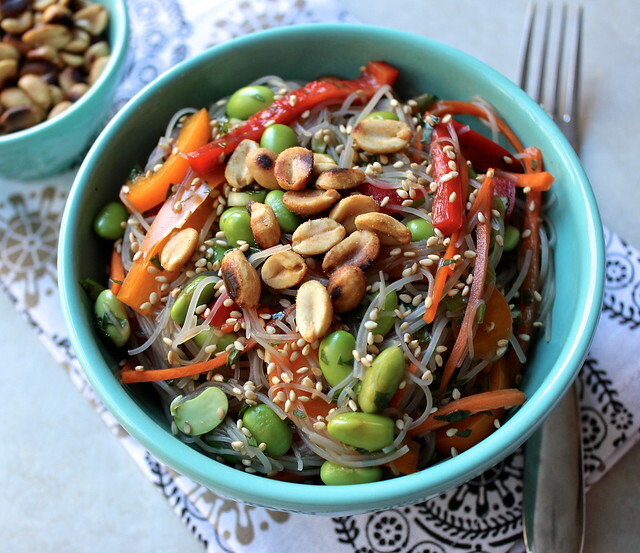 ), and then the whole thing is tossed in a light soy and sesame dressing. I chose to not serve mine over lettuce, but you certainly could. It is also great topped with grilled shrimp or chicken. If you have a mandolin, this is the time to break it out! 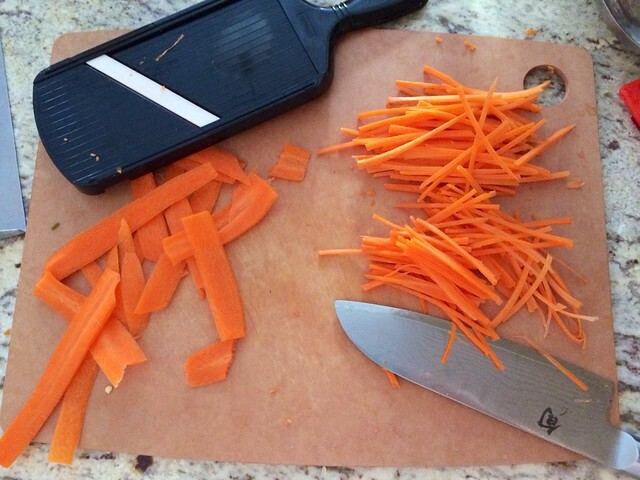 I used it to slice strips of carrots which I then julienned. I also used it for the pepper strips on a slightly wider setting. I am excited to serve this at my next summer BBQ! Such a change from the traditional summer fare. In a small pan toast the peanuts over medium heat until browned. Be careful to not burn them. Cook the rice stick noodles according to package instructions, drain and rinse with cold water. 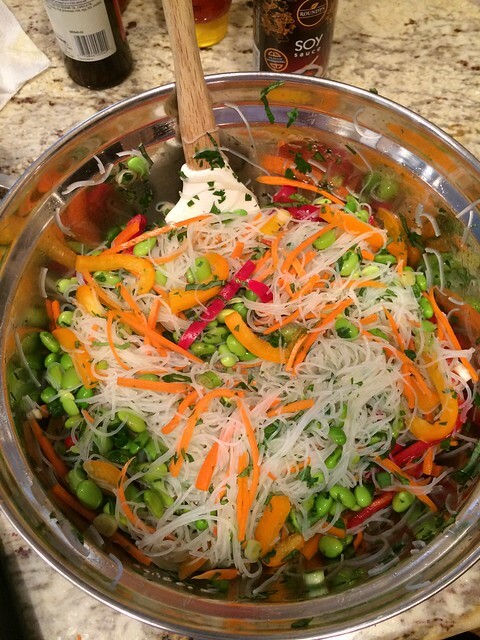 In a large bowl combine the cooked noodles, edamame, carrot, peppers, green onions, mint, basil, and cilantro. Toss with tongs until evenly combined. In a small bowl whisk the soy sauce, rice vinegar, sesame oil, honey, sriracha, and lime juice. Pour the dressing over the salad and toss to combine. 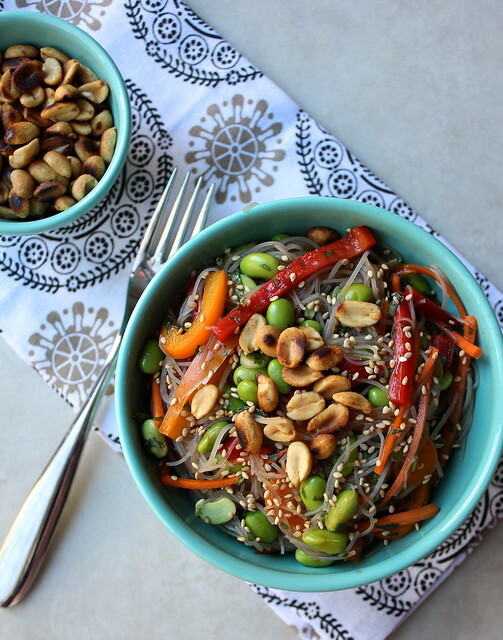 Top each serving with roasted peanuts and a sprinkle of sesame seeds. This looks SO good. Totally pinning. Thanks Kim! I love when you pin things. :) The deck looks AMAZING!